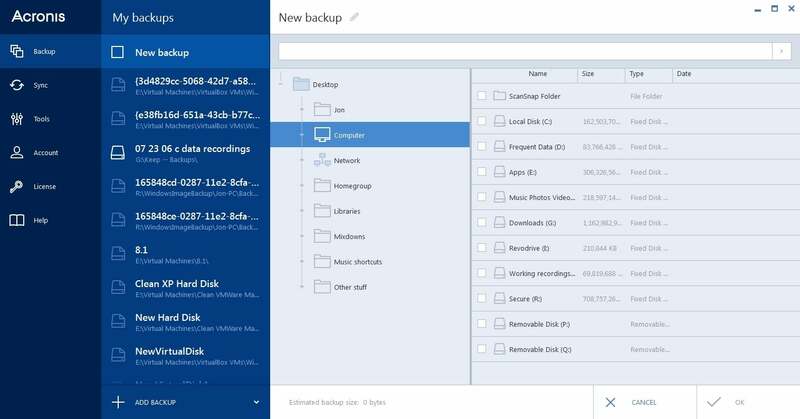 Having reviewed Acronis’s True Image backup solution multiple times over the last decade or so, I’d given up hope that it would ever sport anything that even approximated a friendly user interface. Well, dye my hair red and call me Bozo, Acronis True Image 2015 is now, get this—easy to use. Or at least it should be once they iron out a few more wrinkles. In related news, True Image is now also available for the Mac. Acronis has been busy. 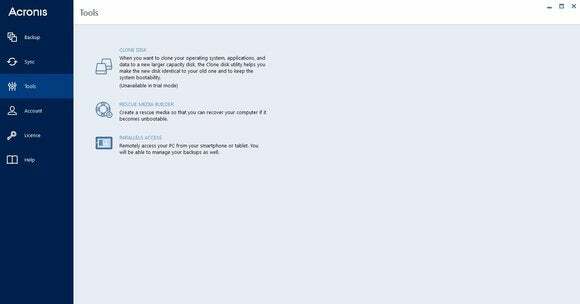 Acronis True Image 2015’s interface is miles better than the company’s previous efforts. Selecting data to back up is much simpler that with previous iterations of True Image. Maiden-version bugs aside, the new interface looks and feels great. It’s handsomely styled à la Windows 8 and logically laid out. The only minor gap in said logic was the grouping of backup and recovery actions under the single heading of “backup.” Most users think of these as separate tasks and start the program to do one or the other. The program sports many ease-of-use features, such as automatically scanning the drives on your system for existing backups. Note that if you have a lot of drives attached to your system, the program might not appear right away, as it enumerates them without providing any visual feedback. Missing in action, but hopefully next up on the True Image road map is automatic selection of important data, i.e. documents, email, photos, etc. This is a mainstay feature for “easy-to-use” backup products that’s saved more than one user's bacon. While the interface is True Image 2015’s most salient improvement, there are also some internal additions and refinements. Backing up your entire PC is much simplified, and universal restore (the ability to recover to hardware different from that on which the backup was made) is now standard across the product line. Acronis also claims improved performance, especially in the realm of small-file copying. The cornucopia of features Acronis has implemented over the years are still there. Simply talking about new features is a disservice to True Image, which has historically deserved mention in any discussion of the best backup solution available. It’s an imaging program at its core: It backs up all the used sectors on a drive or partition to a single file. It does so remarkably reliably, and it creates both incremental (all changes since the last backup) and differential (all changes since the initial backup) images as well as full images. These days it also understands and recovers from virtual hard drive formats, such as those used by Virtual PC 2007 and VMWare. True Image long ago added file and folder backup, though it still won’t perform plain file-copy, and a couple of iterations ago the company implemented an online backup/file service. You can view files stored online via the local client or a Web portal, so you can recover from anywhere to anywhere. And thanks to Acronis’s iOS and Android apps, you can also sync your important data across all your PCs and devices. Syncing devices requires an online storage subscription, which is not included with every version. 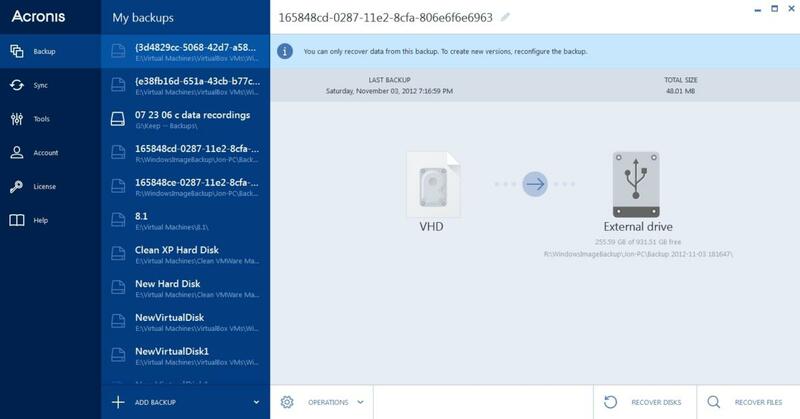 The cornucopia of features Acronis has implemented over the years are still there: email notifications, external program execution before and after backups, compression, encryption, splitting, and support for removable and optical media. One worthy recent addition is the Backup Reserve Copy, which basically duplicates the backup in a secondary location. It’s not as versatile as being able to back up concurrently to multiple destinations, but it’s the next best thing. 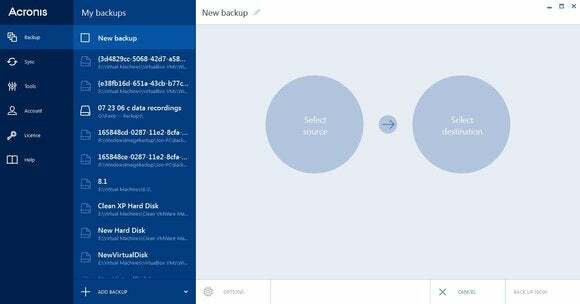 Acronis True Image 2015 also retains the ability to create recovery media, aka boot discs/disks in either USB or optical disc format. True Image also retains the ability to create a hidden recovery partition on your hard drive (or SSD) such as those found on big-name vendor PCs and laptops. True Image still lets you create and boot from recovery media. True Image 2015 is sold in several flavors. Personal is $49.95 for use on a single PC, and $79.95 for use on three (PC or Mac). The Unlimited versions with uncapped online storage are $99.95 for a single computer, and $169.95 for three, per annum. That’s a bit pricey, but it does include the program, updates, device syncing, and online storage with web access to your files. The local program is, of course, yours to keep and will continue to function even if you drop the online storage option. Which brings me to my wish list: it would be nice if True Image 2015 supported non-Acronis online destinations, such as OneDrive, Dropbox, Glacier, et al. Yes, that’s a lot to ask of a company that’s competing in the same market, but I have become addicted to this feature while using SyncBack Pro from 2BrightSparks. Bugs and wish list aside, True Image is as good as it gets when it comes to imaging backup, and it's darn close to it for file and folder backup. Nothing has changed in that regard, and now it’s now easy to use. Wonders never cease. Note: My star rating is based on unresolved bugs and issues in the Windows version at review time and will be revisited when those problems have been addressed. Feature-wise, the product would rate 4 stars. A comprehensive backup solution with local imaging, file and folder backup, online backup and syncing data across all your devices. Now with a friendly interface.